Avocado oil is low FODMAP in one tablespoon. It also has a high smoke point, making it a great alternative to olive oil for high heat cooking. Beef tallow, from 100% grass fed cows, has a smoke point of 400 degrees Fahrenheit and is a good option for frying, searing or sautéing. Coconut cream is healthy fat that gives a slightly sweet taste and creaminess to recipes. Native Forest “Simple” Coconut Milk doesn’t contain gums. Trader Joe’s also offers coconut milk without gums. Nutiva coconut oil is organic and non-gmo. Coconut oil is a medium chain triglyceride (MCT), which is easily absorbed. This duck fat is from pasture raised ducks, making for a healthier duck fat. If you’re trying to add delicious, healthy fat into your diet, start here! Duck fat makes delicious scrambled eggs, as well as just about everything else. I love the taste of Garlic Gold and it's one of the recommended brands that is noted in this article on Garlic Oils. If you don’t have time to make ghee at home, this is a great option too! Many people, including myself, who don’t tolerate other dairy products, still tolerate ghee. Kerrygold butter is made from grass fed cows that are free of growth hormones. Salted Kerrygold is available at Costco. Delivered right to your door, including Canada! 100% grass fed, nutrient rich beef, lamb, bison & dairy, wild caught seafood, heritage pork and free range poultry. 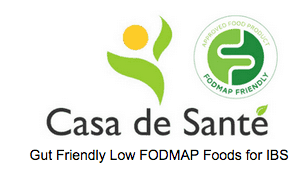 Low FODMAP products for people with IBS and digestive sensitivities. Our brand products are FODMAP Friendly certified. We also sell FODMAP Dietitian approved products. All our products are small batch, artisan and made with the finest ingredients. They contain no additives, preservatives or fillers. 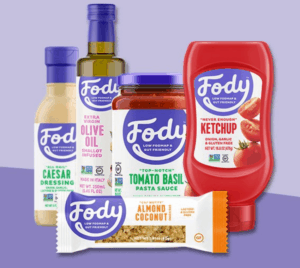 With Fody’s low FODMAP foods, it’s easy to follow a Low FODMAP diet to treat your irritable bowel syndrome! Living symptom-free has never been easier and more delicious with our line of Low FODMAP snacks, sauces, and kitchen staples. Collagen is very healing for those who tolerate it. I add it to coffee, smoothies or water. Gelatin can be used for gummy recipes or to thicken compotes. It can be very healing to those who tolerate it. This collagen is a great option for pescatarians or anyone who prefers a marine sourced protein. 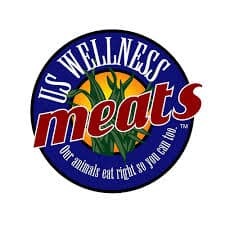 This is a great option for vegetarians or vegans who need more protein in their diet. Try adding it to your morning smoothie. Apple Cider Vinegar (ACV) has so many uses, from food to cleaning. I love that Bragg’s is organic. Rice wine vinegar is low FODMAP in 2 tablespoons. The ingredients in this vinegar include rice vinegar and water. Read labels because some vinegars include other ingredients like sugar. This almond butter is made in a peanut-free facility. It’s also made from blanched almonds (skinless) so it will be a bit easier to digest then almond butters that incorporate the skin of the almond. These almonds are a delicious topping on side salads or smoothie bowls. Homemade pecan butter is my guilty pleasure but if you’re dealing with time constraints or don’t have a food processor, this is the next best thing. Most people have a hard time digesting peanut butter since peanuts are legumes. I generally recommend people try walnut, almond or pecan butters as they tend to be easier to digest. But if you do well with peanut butter then I recommend one like this without added oils or sugar. Sunflower seed butter is a welcome alternative to those with nut allergies or whom have an easier time digesting seeds than nuts. Walnuts are rich in omega 3 fatty acids and antioxidants. Just 1/4 cup of walnuts will give you with a full day supply of your omega 3 fatty acids. Cococnut aminos are a common substitution for soy sauce or tamari. Cinnamon sticks are wonderful in drinks and are always in my spice rack. This vanilla powder smells delicious and adds beautiful brown flecks to gummies or baked goods. This vanilla extract includes vanilla bean extractives in alcohol and doesn’t contain any sugar or other superfluous ingredients. I add Italian herbs to many of my recipes as it’s an easy way to add savory flavor if you don’t have fresh herbs on hand. Real Salt is sea salt with 60+ beneficial trace minerals. It’s available in fine and kosher – which refers to the salt grain size. Freshly ground pepper always tastes and smells better than pre-ground. This yummy powder can be added to milk for a chai tea or to coffee for a “dirty chai”. Ginger is very warming and can be helpful for alleviating nausea. Matcha green tea powder can be used on it’s own to make a green tea latte or in Matcha Green Tea Gummies. Organic Jasmine green tea is delicious on it’s own and also shines in a Jasmine Lime Cooler. White rice flour is a helpful alternative for those who tolerate rice but don’t do as well with coconut or almond. It will contain resistant starch, which will bother some people, but I have found that many people tolerate it. White rice is low FODMAP and is recommended to anyone who needs more carbohydrates in their SIBO diet. If you tolerate white rice, it’s likely you’ll tolerate it in other forms, such as rice noodles or white rice flour. Per the seller’s page, the only ingredient in this is Basmati White Rice (and water I assume!). These wraps contain coconut meat (low FODMAP in 1/2 cup), coconut water (low FODMAP in 100mL) and coconut oil. About 50% of my clients do well with coconut. For those who tolerate coconut products, this will be a helpful way to replace bread or tortillas. Honey is listed as high FODMAP (fructose specifically) but Dr. Siebecker researched a variety of honeys and found clover, alfalfa, cotton and raspberry honeys to be low fermentable because of their glucose/fructose ratios. I typically recommend clover honey as it's easy to find. Even though it would normally be healthier to eat raw honey, many of my clients don't tolerate it as well. Maple syrup is low FODMAP and is well tolerated by many of my clients. This particular maple syrup might be a bit of a splurge but it's pure, certified organic, gluten free and vegan. No matter where you buy maple syrup, check the ingredients to make sure it doesn't have any additives. Sucanant is dehydrated cane sugar that doesn’t go through all the chemical processing that sugar normally does. It is darker in color and has a molasses taste to it but can be used in recipes that call for white sugar. Sugar is low FODMAP. 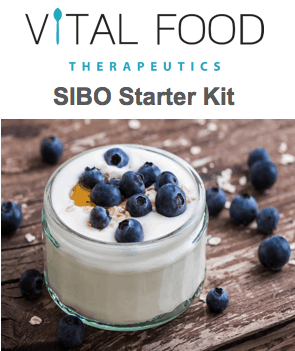 Inulin free Stevia is low FODMAP and is an approved sweetener on Dr. Siebecker’s SIBO Specific Food Guide (SSFG) and the Bi-Phasic Diet. Cacao is made by cold-pressing unroasted cocoa beans, which leaves the enzymes in the cocoa and helps them retain their high antioxidant content. So for recipes that call for cocoa, feel free to use cacao. Two heaped teaspoons of either is low FODMAP. Though I wouldn’t recommend a whole bag at once (as the packaging says a bag is one serving), a small handful makes a great on-the-go snack. Sardines are packed with protein, bone building Vitamin D and are one of the most concentrated sources of omega 3 fatty acids. This mayonnaise is made with SIBO friendly ingredients including avocado oil. This unsweetened shredded coconut can be used to make your own coconut milk. About 50% of the people I see tolerate coconut.